Extend your Reach with ADaM ReCON (Wireless Remote CONtact Manager). Using wireless mobile technology like iPad, tablets and smartphones, your sales people can take customer and prospect information out of the office and into the field. ADaM Asset Management provides the perfect system for managing, monitoring and maintaining your companies assets. The system can be used simply for managing an asset register, a catalog of all your assets or quite powerfully for managing every detail of your assets from scheduling preventative maintenance, routine administrative dates, and attaching important documents. The ADaM On-Line system is an E-commerce add-on that allows you to extend your information to the Web. ADaM On-Line will allow you to provide your customers with order status, account status and product price and availability from your web site. The integrated shopping cart will allow your customers to place orders on-line! Extend your reach with ADaM Mobile Sync, our newest addition to the ADaM System. Empower your sales people with ADaM Mobile Sync. Now your sales force can take all the power of ADaM out of the office. 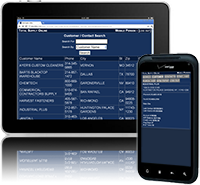 ADaM Mobile Sync allows your sales force to write orders, check pricing, purchase history and delivery information in the field. Then be able to Sync the day's sales and update inventory files over the internet or on the network.